Our client is e-commerce giant with operations spread out across the globe. They were looking for an e-commerce website design which would serve as a one-stop unique platform for selling, deal-making, and online auctioning. With multiple e-commerce subsidiaries under their belt, along with a few auction houses, they wanted to bring all their disparate services under one roof, enabling customers to buy, sell, deal-on, and auction products from a singular, unified website. The client was extremely delighted to see the e-commerce platform developed as per their requirements. The app was able to address visitors from different geographies around the globe while helping to increase the website traffic significantly, thereby leading to significant sales conversions. Outsource Your e-commerce Website Design Requirements to Us! Outsource2india has been in the e-commerce development domain for about 20 years now. We have an excellent and highly experienced team of web developers who can easily understand your business requirements and deliver a customized solution for your company. 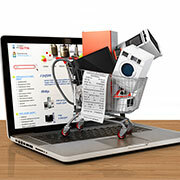 Visit this page if you are interested to read more case studies on e-commerce web development. If you have a similar kind of ecommerce website design and development requirement, feel free to get in touch with our representatives or fill in the contact form, and we will get back to you within 24 hours.